20 year-old male with a pancreatic mass. 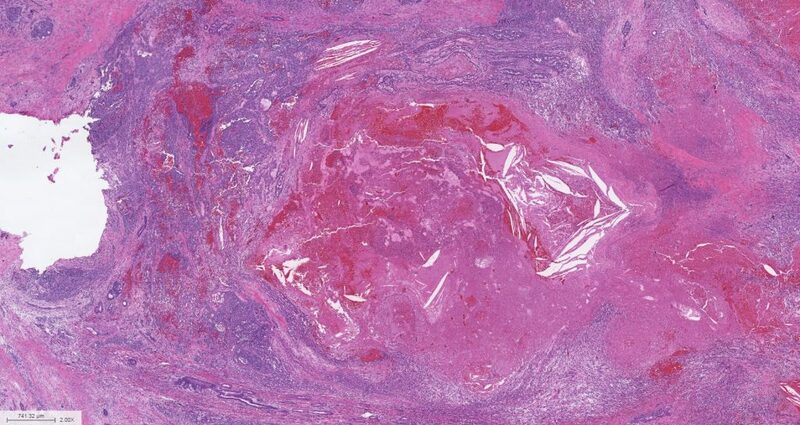 Histology: This pancreatic resection specimen displays a large mass with a fibrotic rim with adjacent histologically unremarkable pancreatic parenchyma. The lesion is highly vascular with areas of hemorrhage, extravasated red blood cells, cystic degeneration, fibrin, collections of histiocytes, and cholesterol clefts. The lesional cells are loosely cohesive with papillary fronds, but in areas form solid nests. The nuclei are predominantly round, with evenly dispersed chromatin. The cytoplasm is amphophilic to eosinophilic, and occasional intracytoplasmic hyaline globules can be identified. Scattered mitotic figures are readily apparent, and regions of tumoral necrosis are present. The lesion is immunoreactive for nuclear beta-catenin, and is negative for synaptophysin, chromogranin, BCL10, and trypsin. Discussion: This is a solid pseudopapillary neoplasm of the pancreas, which classically occurs in the pancreatic tail of young adult women. However, these lesions can occur in children as well as older adults. 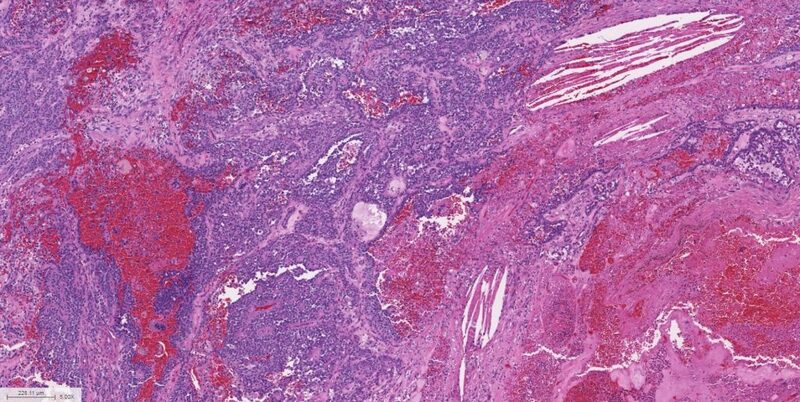 These lesions typically have an indolent course and can be cured with complete resection; however, they do have low malignant potential and can metastasize, for example, to the liver. Solid pseudopapillary neoplasms are in the differential diagnosis of solid cellular neoplasms of the pancreas, which include pancreatic neuroendocrine tumor (PanNET), microcystic/solid variant of serous cystadenoma, acinar cell carcinoma, and metastases to the pancreas. 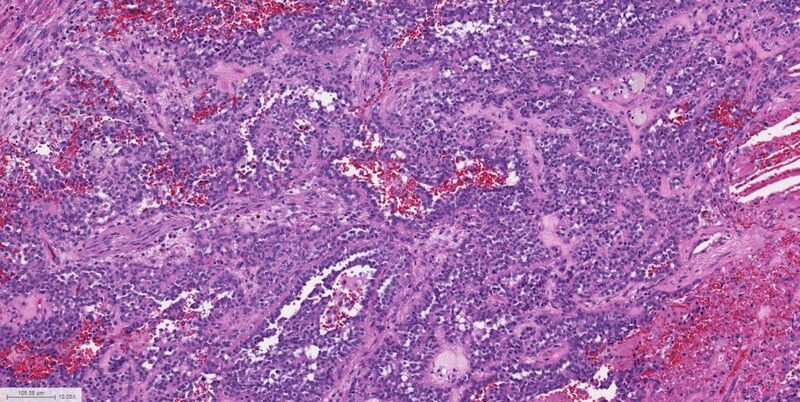 The classic morphologic features of solid pseudopapillary neoplasm are in the name…the lesion is variably solid and in areas (pseudo)papillary! The lesion appears to have papillary fronds due to the loosely cohesive nature of the cells. The presence of foamy macrophages and cholesterol clefts also favor the diagnosis. The nuclei may be oval with coffee-bean grooves, however, as seen in this case, can also be oval with evenly dispersed chromatin (mimicking a PanNET). 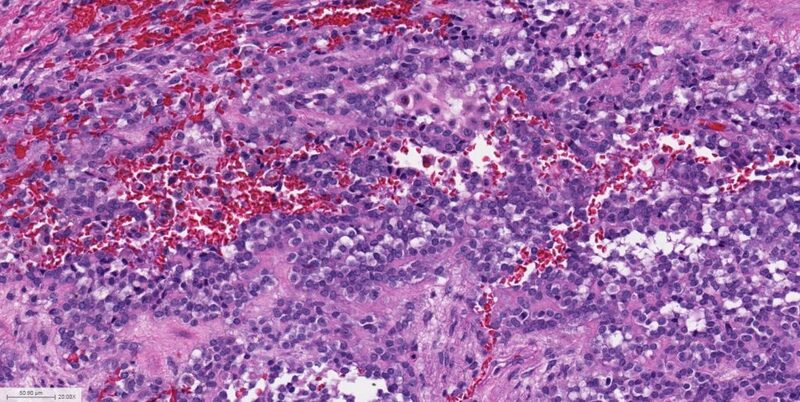 The presence of intracytoplasmic hyaline globules can be seen in either PanNET or solid pseudopapillary neoplasm. The differential diagnosis can be resolved with immunohistochemistry. The most useful immunostain for solid pseudopapilary neoplasms is beta-catenin, which will show nuclear labeling; variable positive labeling can also be seen with CD10, cyclin D1, AR, PR, CD56, synaptophysin and cytokeratin. PanNETs label with neuroendocrine markers and cytokeratin, and acinar cell carcinomas label with BCL10 and trypsin, but neither will show nuclear beta-catenin labeling. 1. Abraham SC, Klimstra DS, Wilentz RE, Yeo CJ, Conlon K, Brennan M, Cameron JL, Wu TT, Hruban RH. Solid-pseudopapillary tumors of the pancreas are genetically distinct from pancreatic ductal adenocarcinomas and almost always harbor beta-catenin mutations. Am J Pathol. 2002 Apr;160(4):1361-9. 3. Law JK, Ahmed A, Singh VK […] Hruban RH, Wolfgang CL, Lennon AM. A systematic review of solid-pseudopapillary neoplasms: are these rare lesions? Pancreas. 2014 Apr;43(3):331-7.